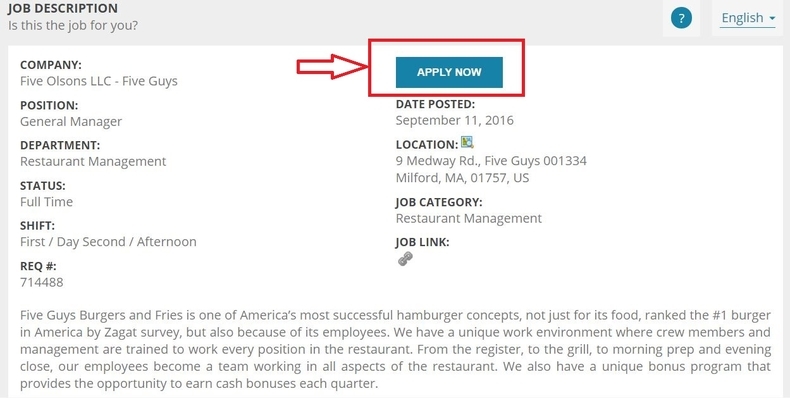 Please go to Five Guys careers page at fiveguys.com/careers to start the online application journey. 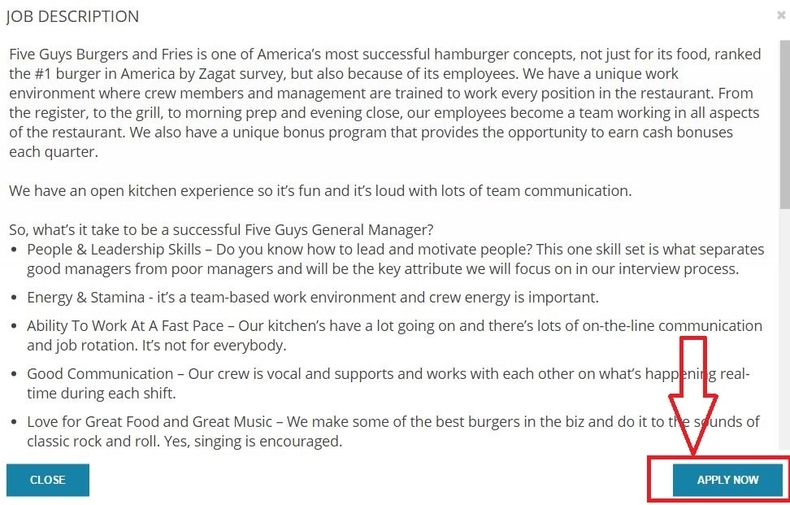 There is a brief introduction to the careers at Five Guys. You may click "Apply Here" to go on. You may check job vacancies by entering job categories and locations. Search results will be presented below. 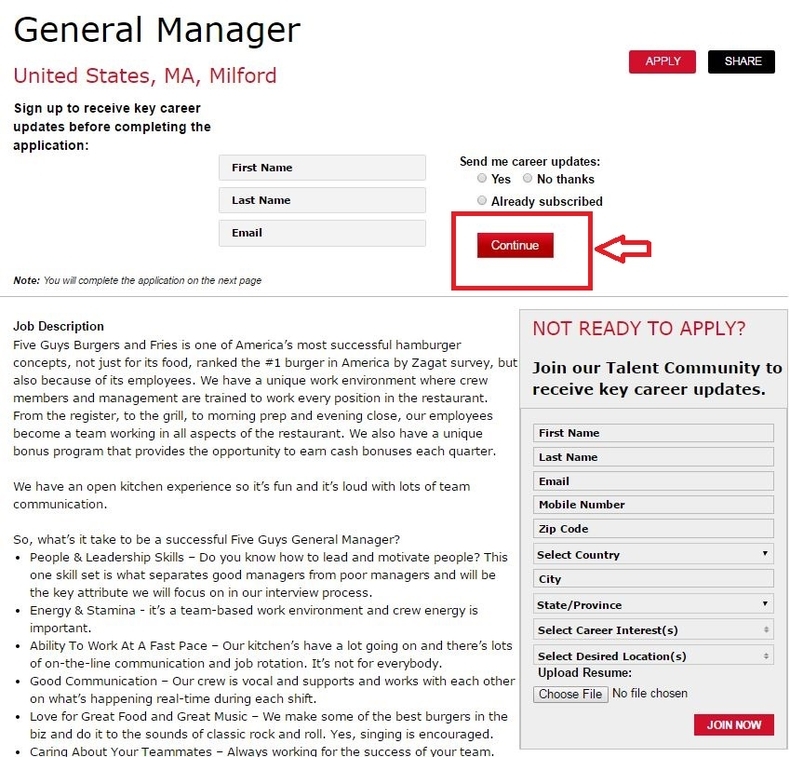 Let's take "General Manager at 9 Medway Rd., Milford, Massachusetts, 01757" as a referring example. Click "Apply" button to continue. Please read the job description below to learn about the position. Make sure that you are able to handle the job and be certain that the job you chose is what you want. And enter your name and email address to continue. In this step, you will be provided some specific information about the position you choose. If you find it no problem. Please click "Apply Now" to go on. You are required in this step to sign in with your phone number and password. If you are a first time user without a talentReef account, please register first. Answer some questions to indicate whether you are now at least 18 years old, whether you're legally to work in this country, and whether you have reliable transportation, etc.Questions with red spots are required. Then click "Next". Enter the information about your education including your degree, the school name, city and state or province. You may click "+" icon to add the college and trade school information. You may select "Yes" or "No" to answer that if you have any work experience. If you do, please enter the information about the work you have done, which basically includes the company information, your earnings and employment dates. After the completion of your employment history, you need to answer some questions related to your references. Then you will see again the job description for you to check and review. If you have made up your mind, please click "Apply Now" to sent your application request to finish your online application for Five Guys. 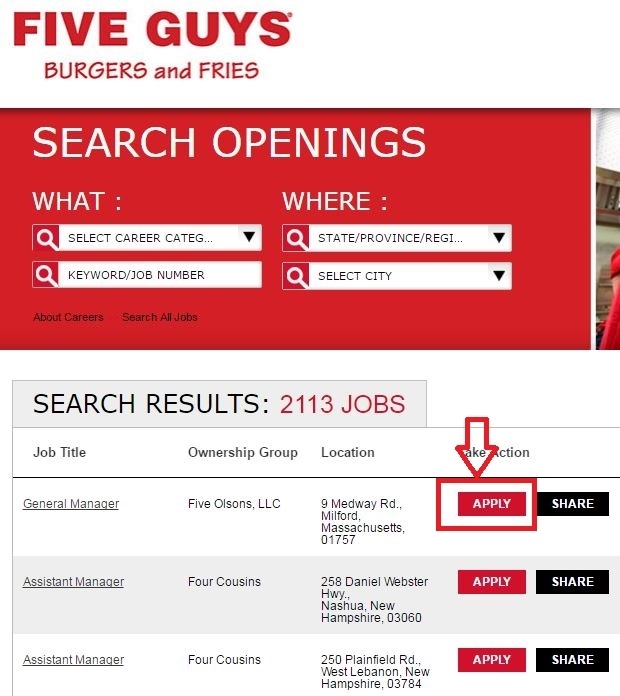 Click fiveguys.com/careers to apply for Five Guys jobs online.